Since 2005, Aeroviaggi has offered its Hotel-Clubs and Holiday Villages in Sicily in combination with charter flights from Deauville. Club formula stays are offered (full board including wine and water, gourmet nights, day and night entertainment, sports and kids club). Our hotel-clubs and villages, plus our tours to explore Sicily and Sardinia, are available from most major French tour operators. Created in 1992, AMERASIA is a professional team who is listening and advising you to prepare your trip. Group and individual travel specialists, AMERASIA, will propose you many destinations with quality services. Amslav Tourism is the leader tour operator in Central Europe, Eatern Europe and Central Asia. Created in 2001, it’s composed of a single service and a group service where a competent and passionate Franco-Slavic team is active. With is 18 years of experience, Amslav offers a full range of tourist services, week-ends, tours, cruises, autotours, seaside stays, or even customized trips. From Deauville : Prague and Budapest for christmas markets. Bravo Club is the « club » branch of the French tour operator « Alpitour France », Italian tour operator’s subsidiary « Alpitour » created in 1947, which already has a great expertise in the world of travel and especially in Holiday Clubs. Friendly and cozy hotels (from 80 to 300 rooms), original and sunny destinations, medium to long-haul fligths. From 66 years, Costa Cruises travels through all seas of the world to offer its guests hospitality, gastronomy and Italian style, a dream vacation for the best of relaxation and entertainment. It is the largest fleet in Europe, with a total of 16 ships, all sailing with the Italian flag. For more than 40 years, Héliades is the unavoidable specialist for the following destinations : Greece and its islands, Cyprus, Sicily, Italy, Cape Verde, São Tomé, Dominican Republic and Portugal. Widely implanted in Greece and its islands, the tour operator works to make you discover this beautiful and endearing country by increasing its offer each year, in atypical and preserved places. Passionate, the teams have a perfect knowledge of each country and a unique expertise to elaborate exceptional stays, revealing the historical and cultural wealth of each region to the closest of its inhabitants and their traditions. Club Héliades, charming hotel or 5 *, wellness, sport or discovery stays, circuit, cruise or personalized trips, Heliades necessarily has the adapted product to desires of escape with an only aim, to make the trip an unforgettable experience. This summer, treat yourself to a Héliades escape from Deauville, and come to discover the Greek and Italian treasures ! Jet Tours is a French tour operator established in May 1968 and now a member of the Thomas Cook Group. 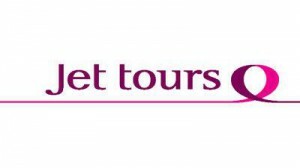 Jet Tours is one of leading tour operators in France in development of the tour market. Nowaday, it offers tours to more than 50 destinations. KIT SOLEIL has existed for 30 years and is experienced in the field of tour operating. Specialist in islands, including Mallorca, for many years. Direct flights operated by airlines selected for their reliability. Annual brochure offers a full range of holidays: from « low-budget » hotels to family clubs and more upmarket hotels. KIT SOLEIL also has special offers to meet the needs of everybody : sports and nature, culture, golf and thalassotherapy. A family company on a human scale ready to answer to all your questions. KIT SOLEIL guarantees you the best price and special tariffs for children below 14 years. MTO Travel the specialist on the Francophone market in Montenegro. It’s a destination of choice for the people who like the big space and the exploration. The Montenegro offers an amazing diversity of landscape in relation to its size. Salaün Holidays, meet the world! Specialized on guided tours for more than 20 years, Salaün Holidays invites travellers to “meet the world”! With its wide range of medium and long-haul flight destinations to United States, Canada, Russia, Vietnam, India, Scandinavia, but also with coach trips in Andalusia, Baltic States, Portugal, Italy, … The tour-operator offers to travellers a deep discovering of our 5 continents wonders. As professional expert in tour creation, Salaün Holidays owns specialized production services on several destinations, as “Pouchkine Tours” (Russia, Eastern Countries, Central Asia), “Nordiska” (Scandinavian countries) and “Entre nous” that draws in Salaün Holidays tours richness and expertise, to offer private and personalized trips. The Salaün Holidays leitmotiv ? Proximity at every stage of the journey : before, through and after the travel, with a great attention on all travel aspects : well thought tours with French speaking guides, best price guarantee, a sharp knowledge of destinations, departures from regional airports in association with Air France, 24/7 assistance, and of course pick-up charge of travellers close to their home with the transfer service city of departure/airport of departure. With Salaün Holidays, fly from Deauville to : Canary Islands, Crete, Greece, Madeira, Sicily and Sardinia. From Deauville : Canary Islands (Lanzarote and Fuerteventura), Crete (Heraklion), Greece (Athens), Madeira (Funchal), Sardinia (Olbia) and Sicily (Palermo). Thalasso N°1 is the first and only French tour operator specialized in wellness travel, also known as the « creator of travel and well-being » and under its brand name « ovoyages ». Leader of the seaside holiday in the Mediterranean basin for the 5th consecutive year offers destinations from Deauville. Leaders in our « chosen Lands » and as a result of our 16 years of experience, TOP of Travel offers holidays in TOP clubs and hotels, on tours and personalized, to new, original and stable destinations at the best prices. TUI, world number one of travel, offers all Marmara Clubs, all Nouvelles Frontières tours and an infinite choice of holidays for a unique experience. TUI, it is 50 years of experience and personalized offers and services all your holidays long, before, through and after travel. 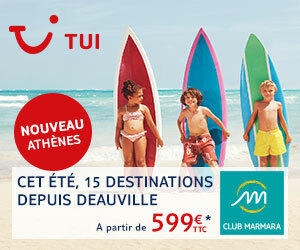 TUI offers trips that look like you: you only have to choose your ideal holidays! For two, in family, alone or with friends, you can choose among more than 180 destinations: a few hours away from your home or on the other side of the world, the most beautiful horizons are open to you.